you will be given a warm welcome of Laos Hospitality on your arrival and transfer to your hotel. In the evening their will be a trip briefing with the tour guide and a great chance to get to know each other. A former royal city with is Grand Palace. A ride on the Mekong takes you to the Pak Ou Caves, a natural cave filled with over 1000 Buddha statues Then onto Wat Xieng Thong a royal Wat built on the banks of the Mekong river built in 1559 which has remained relatively undamaged by the various invasions mainly Chinese over the centuries enjoy the atmosphere at Wat Mai built in 1796 and sits at the foot of Mount Phousi; Wat Mai is the largest temple in Luang Prabang with a five-tiered roof. The main hall shows the traditional architectural style of Luang Prabang with a gold relief of Buddha's life story inscribed on its facade. To end the day we recommend you try climbing Phousi Hill, with its 328 steps, it''s a rewarding walk as once at the summit you'll have for a fabulous panorama view over the town centre and the mighty Mekong River and beyond. We return to your hotel late afternoon and the evening will be at you leisure. After market we continue drive to Khuang Si Waterfall and Bear Rescue Centre, about 30mins from Luang Prabang, the waterfall is set in a natural jungle setting and you will have plenty of time to relax or swim in it’s turquoise cool pools. Return to Luang Prabang Time permitting climb Phousi Hill, with its 328 steps, it’s a rewarding walk as once at the summit you’ll have for a fabulous panorama view over the town centre and the mighty Mekong River and beyond. In the evening explore the Street Night Bazaar, where you can find the lovely collection and handmade textiles by local and hill tribe people. Visit the Royal Palace officially known as Haw Kham which was built during the French colonial era for the King and his family. The site was chosen so that official visitors to Luang Prabang could disembark from their river voyages directly by palace and be received there. In 1975, the monarchy was overthrown and the Palace was then converted into a National museum. Today it houses many artifacts which showcase the richness of Laotian culture. Transfer for your flight to Hanoi. a unique Hanoi an Asian city with tree lined boulevards, French colonial architecture, Ho Chi Minh's Mausoleum and enjoy a traditional Vietnamese water puppet show. The flight departs at 16:40 and arrives at 17:40 in Hanoi on arrival in Hanoi you will be transferred to your hotel. Visit the Ho Chi Minh Mausoleum, the President house, one pillar pagoda and the temple of literature; the first University of Vietnam built over a thousand years ago. Spend the afternoon on a cyclo ride along the old city where you can shop with the rest of the evening free at leisure. Escape the hustle and the bustle and jump in Luxury Cruise in Halong Bay, a quaint little paradise, ideal for outdoor adventure and fun filled for everyone in one of the most stunning bays dotted with Limestone Karsts. Depart Hanoi for the 2 hour drive to Halong Bay, with a buffet lunch awaiting served on board. Cruise through the World Heritage site of Halong Bay. Experience a Vietnamese cuisine cooking demonstration on the sun deck. 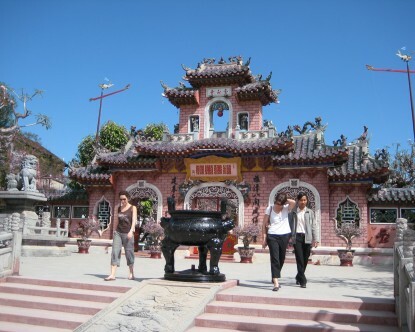 Take a walking tour of Hoi An. See the best and hidden places of this UNESCO world heritage town believed to have been settled no less than 2,200 years ago. Visit the Japanese Covered Bridge, The Chinese Assembly Halls, Tan Ky Ancient House and The vibrant market. For those of you who would like you can take part in a great cooking class and learn and most importantly eat some great Vietnamese cuisine. For other you may prefer to enjoy some free time to explore the town or the wonderfull beach. The scenic road hugs the coastline before crossing over the winding Hai Van pass. A view from the top of the pass is one of Vietnam's most impressive panoramic scenes of Lang co Beach. Stop en route to visit the Cham Museum in Danang City, China Beach and the Marble Mountain, whose peaks represent the five elements of the universe before flying to Ho Chi Minh. Ho Chi Minh formerly known as Saigon and renamed after Ho Chi Minh who led the reunification of Northern and Southern Vietnam. Take a city tour and take an excursion to the Chu Chi tunnels which give an insight to the conditions during the Vietnam War and the resilience of the Vietnam people living underground in large tunnel complexes which comprised of schools and hospitals as well as army barracks. This tunnel system covers close to 200km and even went right under the US air base. Breakfast at hotel. Boat trip on Rach Ngong river and visit fruit orchard and Cai Rang floating market. Lunch at local restaurant. Orient tour in town visit to the Khmer temple Continue to Chau Doc on the route visits to the Bang Lang bird sanctuary. In the afternoon visit Sam Mountain with great views over the Cambodian plains. After breakfast visit the killing fields, used for executions during the Khmer Rouge regime from 1975 - 1979. Return to Phnom Penh and visit the Russian market to pick up a souvenir before having lunch at a local restaurant at 13:00. After lunch transfer to the airport for the flight to Siem Reap which arrives at 16:50. Take a short visit to Les Artisan D'Angkor, a Handicraft centre for wood and stone carvings. Have dinner while watching a traditional Cambodian Aspara Dance. Today is the beginning of your experience in the Khmer Empire start the day visiting the awe inspiring Temples of Angkor for a full day of discovery. First we visit the "Great City" of Angkor Thom, built in the late 12th Century, entering its impressive stone gates and seeing the exuberant carvings, provide a fascinating insight into the Khmer Kingdom. Within the Royal enclosure you will see the Bayon temple, the Phimeanakas Temple, the Baphoun Temple, the Terrace of the Elephants and the Terrace of the Leper King. After lunch we continue on to the most famous temple of the former Khmer kingdom, Angkor Wat. This architectural masterpiece was constructed back in the 12th century and covers an area of around 210 hectares, and today is considered as an architectural masterpiece around the world. Inside, the walls are decorated with beautiful hand carvings and bas-reliefs illustrating Hindu mythology and over 2000 Aspara dancers ornate the temple walls. Visit Ta Prohm - one of the most popular attractions of Angkor as much of the jungle has not been cleared and it looks very much as most of the Angkor monuments would have appeared when European explorers first stumbled across them. Visit Banteay Srei Temple - Seemingly Miniature In Comparison To the Other Angkor Temples, Banteay Srei is considered to be the jewel of classical Khmer art. Built in pink sandstone, the walls are covered in exquisitely preserved carvings of unusual delicacy. Because of its small size, fairy-like atmosphere and extraordinary examples of Khmer sculpture, this temple is often a favorite with visitors.